At Arrowhead Clinics we have treated all ages and types of athletes who have suffered from sports injuries. Have you recently injured yourself during a sport or physical activity and need a Chiropractor to relieve your pain? Arrowhead Clinic has been fixing sports injuries and relieving pain since 1979. Our non-invasive approaches to alleviating aches and pains have been effective in patients suffering all types of injuries and discomforts all over the states of Tennessee and Georgia. Young athletes, high-performance athletes, and adults who enjoy recreational sports all have a risk of suffering a sports injury. When you get injured, it can affect your everyday life on top of your performance and playing time. Seeing a Chiropractor when you suffered sports injuries can help to restore your body's full range of motion as well as help to prevent future injuries. If you are experiencing a recent sports-related injury, call Arrowhead Clinic, the leading Chiropractic Care clinic for over 40 years. When Should I Get Treated For My Sports Injury? It is crucial to seek medical help as soon as possible after you experience any pain or discomfort following physical activity or a sport. Participating in a sport, whether it is running, football, baseball, or something else, you put your body through a lot, which could result in painful sprains, strains, or tears. If you neglect to see a Chiropractor or Doctor following your injury, you risk potentially damaging your body even further, and you may not be able to participate in the sport in the future. Take care of your body and listen to it. Schedule an appointment with a Chiropractor as soon as possible after sustaining a sports-related injury. 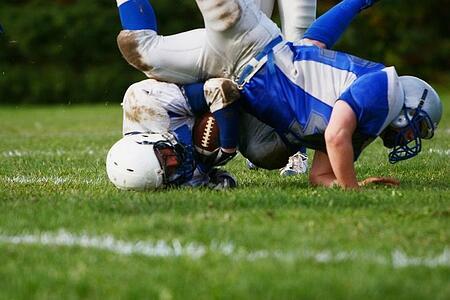 How Can Chiropractic Care Help With My Sports Injury? Chiropractic care helps to treat injuries of joints and muscles in the ankles, knees, shoulders, back, and neck. Arrowhead Clinic Chiropractors are well-versed in manual adjustments of the spine, which relieves tension in the body. The goal of chiropractic treatments is to help the body function better and, in turn, build up a tolerance to future injuries. In reference to sports injuries, athletes tend to suffer pains and injuries due to sudden impacts, over-training, repetitive motions, or improper stretching and warming up. Our Doctors of Chiropractics can assist in alleviating your pain and injury. Chiropractic therapy can help to increase your body's range of motion, speed up the healing process (which minimizes recovery time), and maximize your performance potential. Throughout the recovery and rehabilitation processes, you can count on Arrowhead Clinic to help you get back on the field or race track in top shape. We take a multi-disciplinary approach to treating sports injuries, and we focus on tailoring treatments specifically to the situation and needs of each patient. At Arrowhead Clinic, we utilize cutting-edge technology and every other available resource to fix the pain and get you back to your sports. Manual (manipulative) therapy is performed by hand and focuses on manipulating the muscles and joints to alleviate pain and tension. Manual joint stretching and resistance techniques help to relieve tension in the neck (and other places). An ultrasound reduces any pain and stiffness by sending sound waves into your muscle tissues. Trigger point therapy targets specific tightened pain points on the irritated muscles. Instrument-assisted soft tissue therapy diagnoses and treats muscle tension with the help of special stainless steel instruments. Inferential electrical stimulation is a chiropractic treatment that uses a low-frequency electrical current, which helps to stimulate neck muscles, reducing pain. Therapeutic massages alleviate pain by relaxing tensed or strained muscles. These manipulative therapies help to return your body's muscles and joints to their full ranges of motion. Any of these treatments can potentially be used in your personalized treatment plan, depending on your diagnosis. Your Chiropractor will thoroughly explain your treatment options during your Free Consultation at our Chiropractic Clinic. Relieve Your Sports Injury Today At Arrowhead Clinic! Arrowhead Clinic can help to relieve your aches and pains with non-invasive, effective Chiropractic therapies today! Do not risk damaging your body for the rest of life by ignoring your pain and continuing the same physical activities. If you are suffering from a sports injury, call the Expert Chiropractors at Arrowhead Clinic today! Start scheduling your Free Consultation for your Sports Injury now by clicking the button below.